Kevin de Bruyne's agent is furious after the Wolfsburg midfielder was asked to make a statement about his future at an awards ceremony. The Belgium international was asked to repeat after the host of the event that "I, Kevin de Bruyne, will definitely play this season at Wolfsburg." Patrick de Koster later angrily told BBC Sport no decision has been made on his 24-year-old client's future. Manchester City are weighing up an offer in excess of £40m for the player. The former Chelsea midfielder has been courted by the Premier League side since January and could still move to the Etihad Stadium before the transfer window closes on 1 September. Wolfsburg director of sport Klaus Allofs has said the Bundesliga club is braced for a substantial offer for De Bruyne, but claimed there is no pressure to sell. "We are not a club who needs transfer revenue," Allofs told sport1.de. "If an offer does come in, though, we will discuss it seriously because we cannot ignore the player's interests." 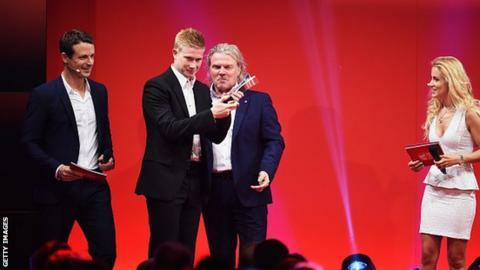 De Bruyne was being interviewed on stage at the Sport-Bild Awards in Hamburg, Germany after being named Lower Saxony's footballer of the year for 2015.